Every month when I sit down to write these, I just end up staring in awe of how big you both have got, and how amazing your bond is. I always wanted a little girl, and I was lucky enough to end up with two, not just two, but two who are absolutely adorable together and the best of friends, and that couldn't make me any happier if I tried. You do have your moment of jealousy, but overall you two are pretty inseparable. This month we have had nicer weather, which has been such a relief, I can't tell you how good it has been to be outside more. You were both getting pretty sick of being stuck inside all the time. We went to the park, did lots of splashing in the paddling pool, and spent most of the weekends playing in nannies garden, Isabelle has been loving all of the new garden toys. Especially the pink car and rocking horse. Emily also got her first bike, and we had a lovely picnic in the park - our first one of the year, which was really exciting. While the girls have lots in common, their personality differences are really showing as Isabelle gets older. They have started to fight lots more over various toys, and which television program we should have on. Which is usually Hey Duggee, In the night garden or Doc McStuffins lately. Isabelle has fallen in love with Iggle Piggle and Upsy Daisy, they are her absolute favourite and we are planning on taking her to see In the night garden live in the summer. Something that I'm really excited to take her to see. I know that she is going to love it just as much as Emily did when she was younger. 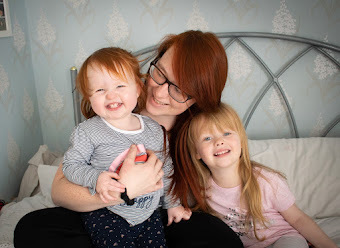 Emily is set to start preschool at the beginning of May, I know that she is really looking forward to it, but I do wonder how Isabelle is going to cope without her. She constantly looks to Emily when shes stuck or wants someone to play with. I'm happy to be that person but in her eyes, I'm not as cool as her big sister, so I do wonder if she is going to struggle a little bit without her. I'm sure Emily will be far to busy playing with her new friends to miss either of us. Emily has really enjoyed reading Isabelle stories this month, I constantly find them sat together reading various stories. Isabelle is really enjoying the 'that's not my' books by Usborne. They happened to be Emily's favourite when she was younger too, so we have about 20 various titles. Safe to say it is going to take them quite a while to get through them all, so I'm not too worried about them getting bored or growing out of this habit. Isabelle is a lot more mobile now, meaning Emily has to be really careful with her toys, as Isabelle tends to grab them and steal them as soon as she isn't looking. I did tell you she was trouble. Surprisingly they are both doing really well with the whole sharing thing. They do have their moments, but what siblings don't. Emily constantly thinks about Isabelle, whenever she goes to get herself a snack out of the snack basket, she will get one for Isabelle too, it's really sweet.